He’s trailing in the polls against Republican businessman Ron Johnson — the TPM Poll Average gives Johnson a healthy lead of 51.6%-44.8%. In addition, Public Policy Polling (D) will have another survey out today, showing Feingold down by double-digits as a result of a “massive” enthusiasm gap between Republican and Democratic voters. Thomas Holbrook, a political science professor at the University of Wisconsin-Milwaukee….explained that as of now, the race still has not heated up — and people still don’t really know Johnson: “Right now people don’t know much about him, other than he’s the guy running against Feingold.” As such, Feingold and his supporters have the task of defining Johnson negatively in the voters’ minds. Several commenters to this post make the point that much of Johnson’s current lead in the poll average is due to the effect of Rasmussen’s numbers, which are typically five points too favorable toward Republicans. So things might not be as bleak as they look. Then again, they might. And that would be a tremendous loss. 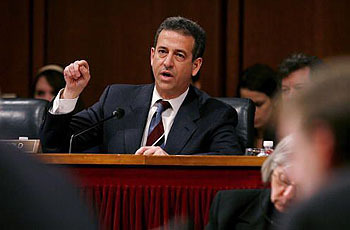 I was pretty annoyed at Feingold for his quixotic decision to support the Republican filibuster of financial reform, but that doesn’t change the fact that he provides a uniquely honest and valuable voice in the Senate. That makes this a bellwether race to keep a close eye on. Do we really want to lose the only person who voted against the PATRIOT Act back in the dark days of 2001?